Find My Workspace lists over 95% of the business centres market in King's Lynn. Simply click Request Quote to check pricing for one office, or Add to Basket for multiple offices. 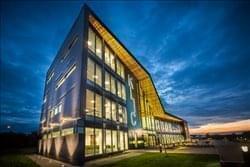 West Norfolk’s newest business hub, this Innovation Centre is a centre for business formation, knowledge transfer and engagement with world leading companies. Tenants and clients benefit from top specification, serviced office space, on flexible terms as well as modern conference suites, luxurious breakout spaces and an optimum working environment, all equipped with the latest modern technology.